DC08. Japanese Kokeshi Beads 6pc 1/2"
Assortment of tiny Japanese Koseshi beads. The tiny beads are about 1/2" in size and painted in assorted colors of red, purple, pink, orange and blue and decorated with little white dots and hash marks. The beads seem to be old with the wood darkened and paint slightly faded with age. Each bead has a round body and round head, painted with black hair and little faces. 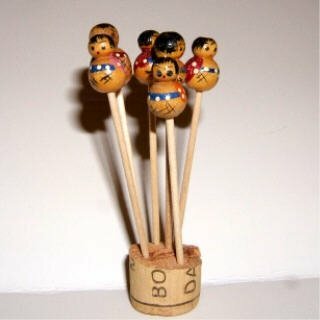 The beads have a hole from top to bottom and are displayed on toothpicks in a cork base.